Prior to the merger of businesses between SapuraCrest Petroleum Group and Kencana Petroleum Group, Ms Gee was an Independent Non-Executive Director of SapuraCrest Petroleum from 4 December 2001 to 15 May 2012. She was also the Chairman of the Audit Committee of SapuraCrest Petroleum. Ms Gee is a member of the Malaysian Institute of Certified Public Accountants and the Malaysian Institute of Accountants. She has more than 40 years of experience in the financial and auditing line within multiple industries. Her professional strengths are in restructuring, reorganisation, change management and corporate governance. Ms Gee started her career with Pricewaterhouse in 1969 and left in 1981, her last position being the Senior Audit Manager and Continuing Education Manager. She then joined Selangor Pewter Group as the Group Financial Controller during which period she was seconded to the USA from 1983 to 1984 as the Chief Executive Officer of Senaca Crystal Inc., a company in the Selangor Pewter Group which was undergoing reorganisation under Chapter XI of the U.S. Bankruptcy Code. Subsequently, from 1985 until 1987, Ms Gee became the Personal Assistant to the Executive Chairman of the Lipkland Group. In 1987, Ms Gee was appointed by Bank Negara Malaysia as the Executive Director and Chief Executive of Supreme Finance (M) Berhad, a financial institution undergoing rescue and reorganisation under the supervision of the Central Bank. She held the position until the successful completion of the reorganisation in 1991. 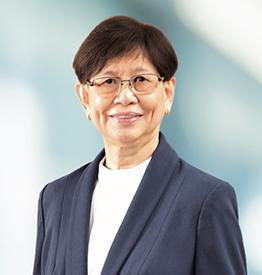 Ms. Gee later served Land & General Berhad from 1993 to 1997 as the Group Divisional Chief, Management Development Services before joining Multi-Purpose Capital Holdings Berhad from 1997 to 1999 as the Executive Assistant to the Chief Executive. During this period, Ms Gee was also a Director of Multi-Purpose Bank Berhad, Multi-Purpose Insurans Berhad and Executive Director of Multi-Purpose Trustee Berhad. Since 2001, Ms Gee has served on several boards of public listed companies. Attended the International Banking Summer School (IBSS) Cambridge, Massachussetts, United States of America.